High Touch High Tech Birthday Parties are totally hands-on for each and every child. This party is not a show. Each child will become a REAL scientist, performing REAL experiments! Every child will create cool take-home items, and the birthday child will create an awesome science birthday gift. 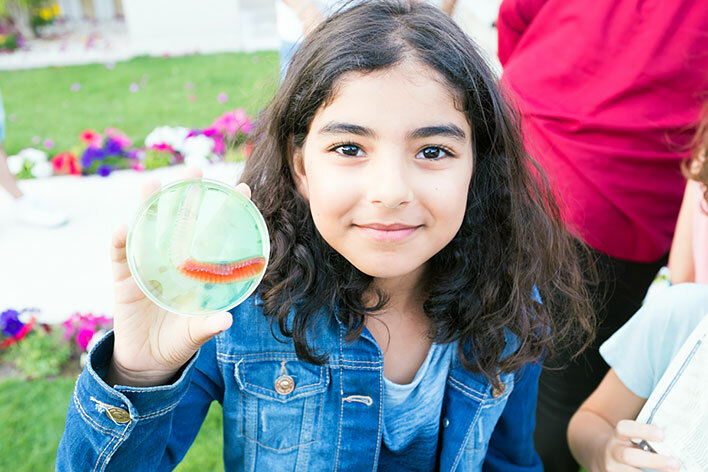 The scientist coming to your home is a dedicated professional with a degree in Education or Science, and works year-round fueling the scientific imagination of children! Each child will use a real laboratory pipette to turn our super science powder into yummy Gooey Gummy Globs. After the experiment the children may add their pipette to their goody bags! The second experiment is a full chemical reaction where each child will create a ball of Silly Putty to take home. This is the kind of silly putty that you can stretch into a HUGE noodle or roll into a bouncing ball! The third experiment is "Fishing for Ice Cubes", and is a fantastic Kodak moment. The children will use a small piece of ordinary string and a bit of science to yank a big ice glob out of a full glass of water! Finally, the children will gather in groups and use laboratory flasks and cylinders to measure and mix chemicals for incredible Volcano Eruptions. Wow! The Globs and Goo Party lasts for about 1 hour and 15 minutes, and the cost is $200.00 for up to 15 children. Each additional child is $5.00. Globs & Goo Party, Plus the Electrifying Lightning Globe! This party features all the cool experiments of the Globs & Goo Party, with the addition of our Electrifying Lightning Globe. Each child will have a turn to safely touch real lightning! This party lasts for about 1 hour and 30 minutes, and the cost is $215.00 for up to 15 children. Each additional child is $5.00. 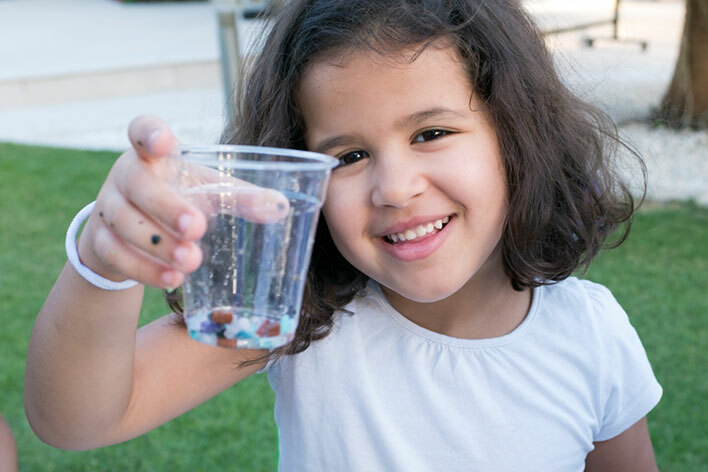 The gem dig is our most popular party package, and includes, the Gooey Gummy Glob experiment, Super Science Silly Putty, and the Awesome Volcano Eruptions. Each child will also become a true geologist, and will use a crusty old miner's plate to pan for gems in our "rivers". The young scientists will use the same panning method as the old-time prospectors and present day geologists! The gems are REAL and come from all over the world. Examples include Bloodstone from India, Dalmatian Jasper from Mexico, Citrine from Brazil, and Poppy Jasper from right here in Texas! Of course, the children add all of their treasures to their goody bags. The Sizzlin' Science Gem Dig Party lasts for about 1 hour and 15 minutes, and the cost is $225.00 for up to 15 children. Each additional child is $5.00. Sizzlin' Science Gem Dig Party Plus the Electrifying Lightning Globe! This party features all the cool experiments of the Sizzlin' Science Gem Dig Party, with the addition of our Electrifying Lightning Globe. Each child will have a turn to safely touch real lightning! This party lasts for about 1 hour and 30 minutes, and the cost is $240.00 for up to 15 children. Each additional child is $5.00. The children will begin this party with a gem dig; however, in addition to the cool gemstones, the children will discover real, ancient shark tooth fossils. The children will keep every treasure they find! Next, our scientist will pass our assortment of fossils around for a close up, hands-on examination by each child. One of our dinosaur fossils was dug up right here in Texas! The children will then create a real imprint fossil to take home, and then will close out the fun experiments with Awesome Volcano Eruptions! This party lasts for 1 hour and 15 minutes, and the cost is $225.00 for up to 15 Children. Each additional child is $5.00. The most amazing part of science is that the possibilities for fun are absolutely Without Limit! 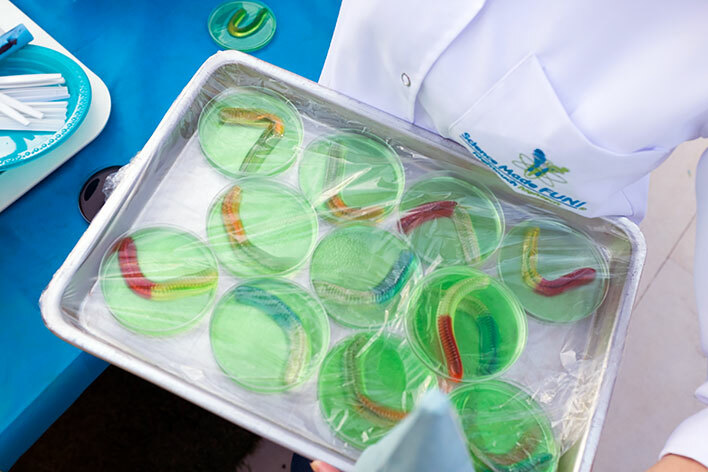 Our scientists can help you customize a party by substituting other experiments to suit your child's party theme. Substitution examples might include a Rocket Launch or "Alien Sneeze" for a Space-Themed party, or for a Chemistry-Themed Party. Do not hesitate to call, and we can help you create fun science memories that will last a lifetime! Contact our office or complete our online registration form. We are looking forward to helping you plan your High Touch High Tech Sizzlin' Science Birthday Party!